I'm delighted to be able to offer the first chapter of my new security book, Linux Server Security: Hack and Defend, for free as a downloadable PDF. Chapter One, entitled Invisibility Cloak, walks you through making your servers invisible online to the extent that not only can you successfully hide your services but even your servers themselves aren't discoverable on the network. Despite removing the most common attack vectors you might be surprised to discover that you can still access your servers over the command line remotely and continue to run key production services. The chapter walks you through, step by step, the obfuscation of your servers so that their attack surfaces are significantly reduced and they are less prone to attacks. Click the link below to download the free PDF. Here's links to two much appreciated five star reviews: Help Net Security Review and Full Circle Magazine. 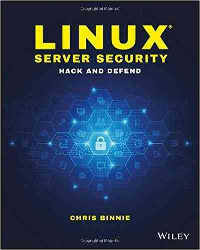 Linux Server Security: Hack and Defend presents a detailed guide for experienced admins, aspiring hackers and other IT professionals seeking a more advanced understanding of Linux security. Written by a 20-year veteran of Linux server deployment this book provides the insight of experience along with highly practical instruction. The topics range from the theory of past, current, and future attacks, to the mitigation of a variety of online attacks, all the way to empowering you to perform numerous malicious attacks yourself (in the hope that you will learn how to defend against them). By increasing your understanding of a hacker’s tools and mindset you're less likely to be confronted by the all-too-common reality faced by many admins these days: someone else has control of your systems. Master hacking tools and launch sophisticated attacks: perform SQL injections, deploy multiple server exploits and crack complex passwords. Defend systems and networks: make your servers invisible, be confident of your security with penetration testing and repel unwelcome attackers. Increase your background knowledge of attacks on systems and networks and improve all-important practical skills required to secure any Linux server. The techniques presented apply to almost all Linux distributions including the many Debian and Red Hat derivatives and some other Unix-type systems. Further your career with this intriguing, deeply insightful, must-have technical book. Diverse, broadly-applicable and hands-on practical, Linux Server Security: Hack and Defend is an essential resource which will sit proudly on any techie's bookshelf.